When watching tonight's Game of Thrones episode, you can try smacking King Joffrey every time he says something petulant, but replacing your TV screen gets expensive after awhile. Instead, fire off a few spit balls at this King Joffrey target. 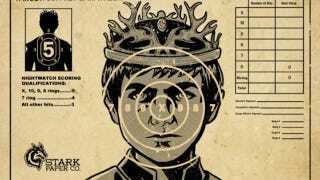 The target, which you can purchase through RedBubble, is also available as a t-shirt, although I might worry that the sight of Joffrey with a bullseye over his face would be a little too tempting for some Game of Thrones fans. It might be safer to hang him on the wall.